NOTE: Does Not fit Grand Sport or Z06. Get the best of both worlds with the SoftShield Car Cover. The SoftShield Cover combines the outdoor protection of the MaxTech Car Cover with the paint pampering qualities of our Premium Flannel Cover. The SoftShield's three outer layers are made of the same UV treated polypropelene material that makes our MaxTech Cover so durable. 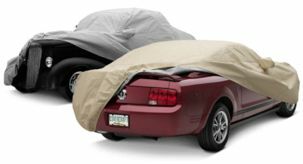 The inner fourth layer is made of a soft polyester nap, which gently protects your car's finish. SoftShield repels dirt and pollutants while remaining breathable. Cover includes front and rear elastic hems, custom fit mirror pockets, non-scratch tie-down grommets, storage bag, tie-down cable and cable lock.